We decided to start with just one hive, with the idea of getting it through the winter, then adding 2 more this spring. Reason being the expense of getting started and if we messed up, we would only lose one colony instead of two or three. I believe, though, that we were doomed from the start. We ordered our bee package and all of our supplies though a local supplier, thinking we would be better off dealing locally. While I still believe this is true, the supplier still orders bee packages (bees that have just been put together and must be “Trained” to accept and work for an unknown Queen) and nuc’s ( 4 or 5 frames of bee’s with an established Queen) from a bee supplier in Georgia. For those that live in or around Georgia, you already know what kind of weather you had late winter and spring 2013. Cold, Wet, and LONG! This kept package bee production to a minimum, with most shipments going out 1 to 2 months later than projected. We were scheduled to get our bee package on April 13, 2013, but it did not arrive in our hands until late June. This put our colony behind about 2 months-thats two months less of quality brooding time needed to grow a strong colony to over-winter. 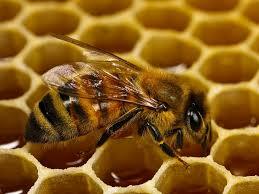 We inserted the package into a single hive body and begin liquid feeding immediately. We continued feeding 1-2 times a day until late august when the single hive body seemed to be pretty full with brood and honey. 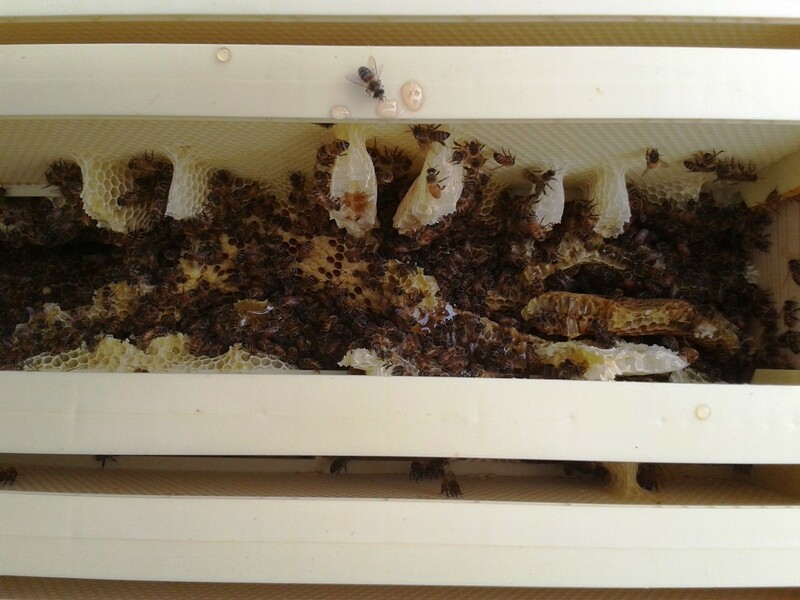 We then added the second hive body on top and reduced feeding to daily or every other day. Other than removing the top lid to add feed, I left the hive alone, since the bee’s know more about what they need to do than I do. It was about late September, early October when I decided to actually go into the hive and see the progress the bee’s had made. At this point, I had hoped that the second box would be nearly full of stores for the bee’s to live through winter. The above pictures are exactly what I pulled out of the hive on that day. Not a pretty picture or anything like what I was expecting. Unfortunately, being that in our region nectar is pretty well done by Mid-October, I again began feeding feverishly. 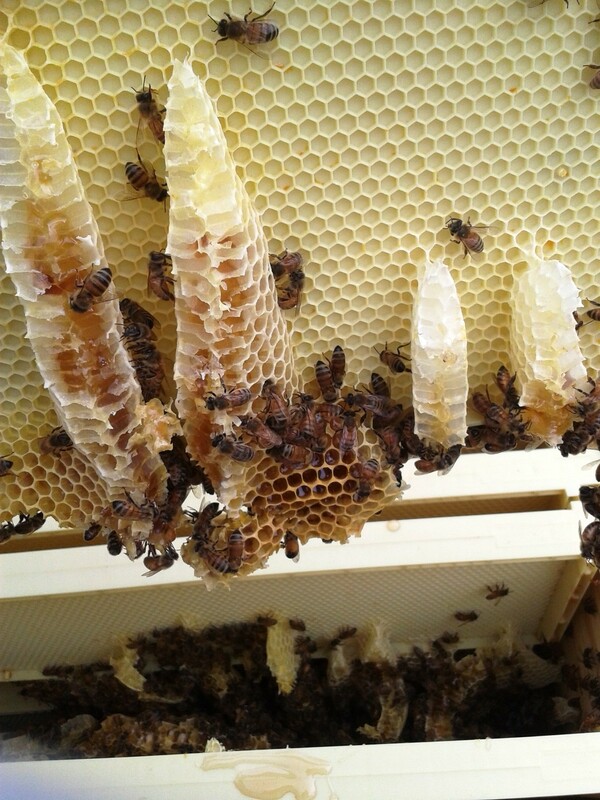 I thought that although the comb production was haphazard, maybe with enough feed, they could still fill the frames with enough stores for winter. This did not happen. My thoughts about what the bee’s should do and what they were going to do were two different things. They did not eat, my feeder sat on top untouched. They did not grow their stores much, so I had to come to the realization that I would probably lose this hive before spring. I checked again in November, then again in December: no real change but my bee’s were still in tact. Maybe they could pull through if we have an early spring. Anyone that watches weather much, knows what this winter has been like in the Mid-Atlantic Region. Here it is March 24, 2014 and it is snowing like crazy outside. This is the winter that just won’t stop. So I guess there was little hope for my fledgling colony. We have had a few sixty degree days,-just a spring teaser-so I was able to open the hive and see if there were any survivors. Of course, there were not. The hive was completely empty except for a few dead carcases on the bottom board. I was very dis-heartened, but I am one that will stick with a plan once I start. I ordered two nuc’s for spring, which are scheduled for delivery on April 5, 2014. 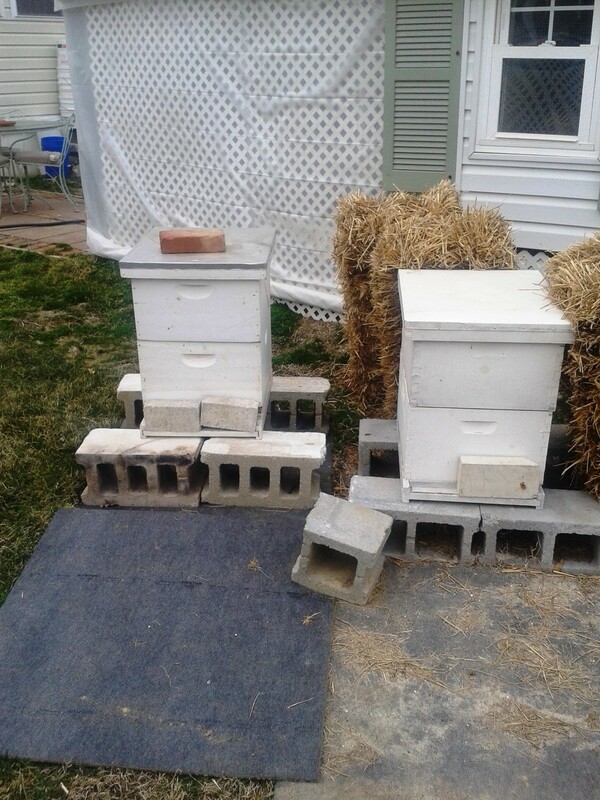 I am in hopes that using nuc’s this year will increase my odds of over-wintering the hives. Well, my hives are cleaned and ready for the new arrivals. I have set them next to my over-sized rabbit hutch, which was originally built to house my chickens. And hopefully in the near future will be able to house chickens again. But for now I am concentrating on getting my new bee’s when they arrive to adapt to their new environment. Hopefully since they are coming from Minnesota this year, they will quickly adapt to our weather and will over-winter well. My plan is to have 3 hives next year, so it would be nice to have two strong colonies to start with in Spring 2015-and maybe even some honey! That’s a great shame but hopefully things will improve. 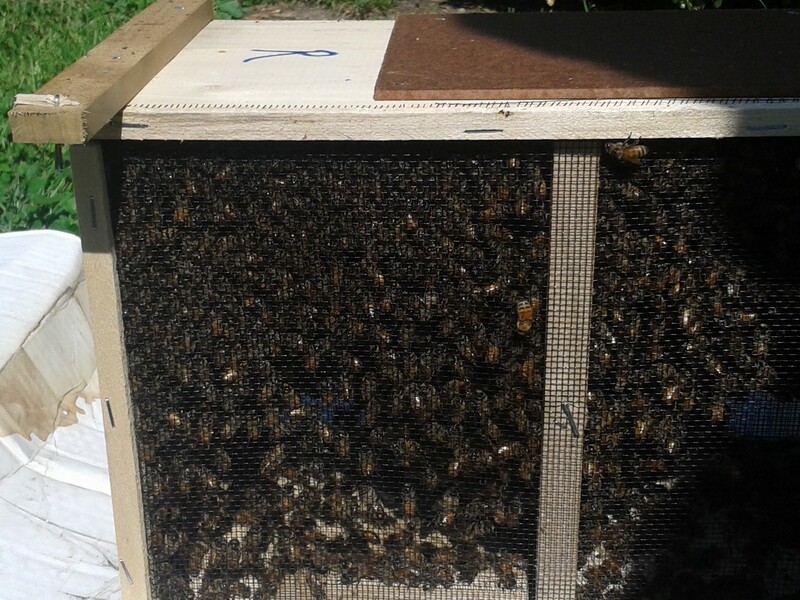 We have just bought our first beehive so, fingers are crossed! In talking with our local club members, the last two years have been devastating to the bee population. So I can’t feel too bad if bee keepers with 30 years experience lost colonies too. Just goes to show how important it is to get more bee hobbyist’s. Best of luck, I wish you great success in your first year. No, don’t feel bad. It’s just such a shame but we can only but try. Good luck with yours as well.